In the Polar Flow service, you can adjust your privacy settings for three different instances: your Profile, your Sessions and your Activity summaries. Each of these has three levels of privacy you can choose from: Public, Followers and Private. All these terms and how they affect your visibility in the service are explained on this page. You can adjust your account privacy to your liking by choosing the most suitable privacy level for each instance. By default all settings are set to Private. Everyone (including people not signed in to Flow) can see your full profile details and your training summary. People signed in to Flow can find you in searches and ask to follow you. Only your followers can see your full profile details and all-time summary. You can also automatically confirm all requests to follow you. By default the automatic confirmation is off and you need to accept each follower individually. Only you can see your profile. You can’t be found in searches. If you comment or share public data, your name and picture are shown. Go to Settings > Privacy to choose session privacy. Changes apply to future sessions. If you wish to change all past sessions to Private, you can click on the button Update all to Private.You can also change the privacy setting for individual sessions in the web service in your Feed or Training analysis view. Session summaries in the Feed look like this: your name and picture are visible. Session summaries in the Training analysis view look like this. Everyone (including people not signed in to Flow) can see your training sessions. Only your followers can see your training sessions. Only you can see your sessions. Note that when you share private sessions in a group, club or an event, people in those groups can see the shared sessions. Activity summaries look like this. Only your followers can see your activity summaries in their Feed. Only you can see your activity summaries. This is the default setting for activity summaries. Note that when you share private activity summaries in a group, club or an event, people in those groups can see the shared summaries. This section explains the ways in which you can share your data in Polar Flow and outside it. Relive is an animated breakdown of your training session. It highlights the most interesting parts of it. Relive includes a link to the analysis view of the training session. You can share Relive videos via a direct link. You can copy the link of your profile (URL) from your web browser’s address bar and send it to your friends. For them to access it, your profile privacy must be set either to Public or Followers. Your name and picture are always seen, unless you’ve set your Profile as Private. You don’t need to be signed in to Flow or be a registered Polar user to see the content as a direct link. If you share your data in groups, clubs or events in Flow, your name and picture are shown even if you have a private profile. 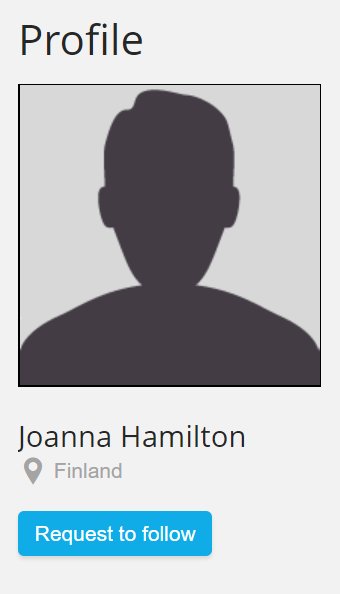 If you comment in groups, clubs or events in Flow, your name and picture are shown even if you have a private profile. You can share your Flow data to external services like Strava, TrainingPeaks and Endomondo. 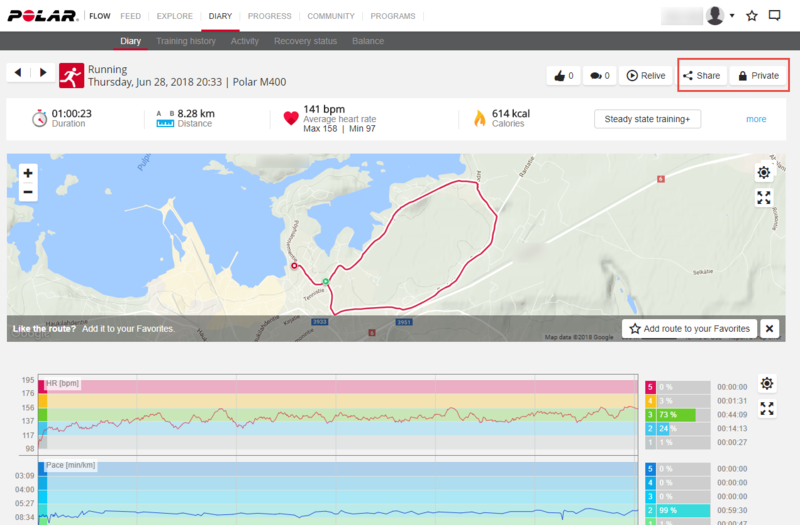 This can be done by exporting training sessions individually from the Training analysis view, or by connecting your Polar account with these services and allowing them to sync automatically. Automatic connections with external services can be managed in the settings, either under account or your profile, depending on the connection type. When you open an automatic connection, the external service provider can access your profile, your training data and your other data, depending on the connection type. Please read the privacy policies of these external service providers before creating any connections to understand how they use your data. You may cancel your automatic connections at any time. Only training sessions set to Public are visible in Flow Explore. Training sessions set to Private or Followers are not shown in Explore. If your profile is Private but you still want to make one of your training sessions Public, the session is visible on the map but your name is replaced with ‘Private User’. Note! When you allow people to see your training sessions that contain GPS data, you are sharing your precise geographic locations of your training sessions. When training in sensitive locations, always keep your sessions set to Private. Sensitive locations can be for example your home, school or certain work places such as government agencies or army bases, and in general any locations that you do not wish to be revealed publicly. This setting is related to the Polar Club group fitness app used by fitness clubs. If you’re not going to any fitness club that uses Polar Club, you don’t need to worry about this setting. And if you are, this setting means that your fitness club can send you summaries of your training sessions by email.